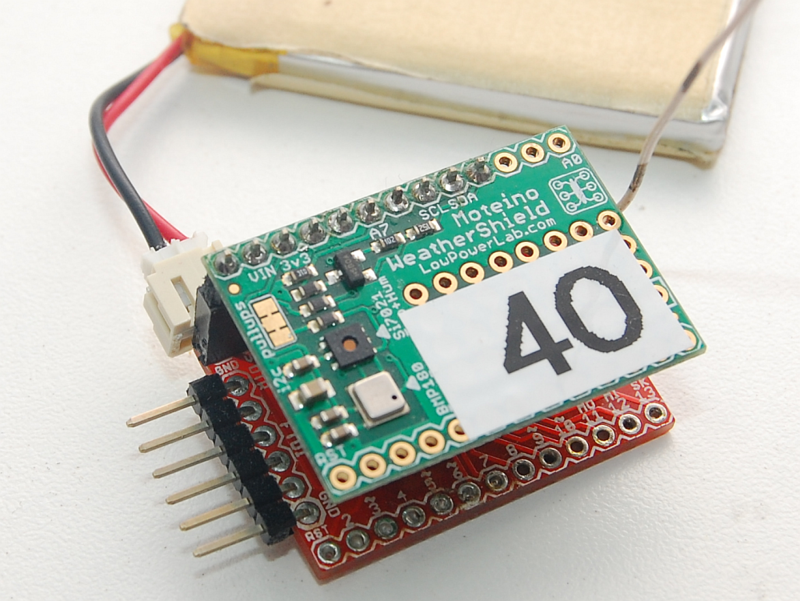 I have a Moteino with a WeatherShield 3v3 attached (soldered piggyback) and I'm using your lowpower.h to reduce power consumption. Even with just the sleep function running the unit is still drawing .47ma. It's odd because my Mailbox Notifier draws 1.4ua. I even tried the Mailbox sketch on the Weathershield Moteino but it still draws .47ua. What am I doing wrong? I am measuring current with my Amprobe meter in series with the Vin line. I provided a sample sketch here which should give you a low power consumption. I should have mentioned that I started with your sketch and in trying find the root cause I removed pretty much everything I could but even your sketch draws exactly the same power -.47ma...but it works great. I have it updating my Motieno Gateway regularly but I want to run it from a battery and this is too much current draw to do that. Would have been nice to not solder them together and do the measurements afterwards. Now it's a bit more difficult to do any debugging. I have pretty much the exact same setup (except I only soldered the actually connecting pins), same sketch, running from the attic at max TX (i think a RFM69HW, 20dBm). Been running on a lipo (1800mah) for the past 5-6 months or so and it's at 4.04v...never touched it. If I were to de-solder it, could you give me any pointers on what to look for while debugging? Measure the moteino first, then the weather shield, then together. If coded for low power the moteino should draw very little current. Also the power shield has a battery circuit (which a 10k+4.7k voltage divider) which should be shutoff by marking pin A3 as INPUT (high Z), and enabled (OUTPUT LOW) only when reading the battery on A7. Otherwise if you don't do this you can fully expect half a milliamp of usage through that resistor network. You should power the setup via the GND and VIN with no more than 5V if you want valid battery readings. I de-soldered the entire board then tested the Moteino. By itself it was drawing 1.4ua while using your recommended sketch. Perfect! I then added power and ground to the shield and it drew about the same current. I then reconnected the WeatherShield to the Motieno with just power and ground. Current draw was unchanged-1.4ua. I then soldered A7, SCL and SDA onto the Moteino and saw no change in the current draw. Once I added pin A3 the current draw went way up. into the hundreds of micro-amps. The code to set A3 to INPUT/OUTPUT is in the sketch. I do nothing different, I have a RFM69W on one of these, and HW on another, the HW one has been running the longest without a charge. One thing I probably missed to add is flash.sleep() when FLASH MEM is present, but already the chip is low power so that should not cause a problem. These are things you can easily verify. unfortunately I can confirm the same results of buster999. In my configuration the moteino is supplied with +5V. I've also verified that the voltage on pin A3 is HIGH, but not at 5V, only around 4.05V, and I've measured around 390uA flowing trough that pin. I've also tried to used different (digital pins) but there is the same problem. It seems that the arduino has an internal pulldown around 10k - 15k. If there is any measurement that can be useful, please let me know. How do you supply 5v? To what pin? Can we see a schematic of what else you have wired? A3 should be ~3.3v to keep the voltage monitor disabled and no current flow.